Most days I think I am the luckiest guy in the world. I get to work with big machines in the middle of a beautiful forest. What more could a guy ask for. It is no accident that I have the job that I have today. I have always loved being in the forest, and I have always enjoyed working with machines. Running a sawmill is the perfect combination of these two passions. When I started putting the sawmill operation together, I realized that I had much to learn about the machines specific to woodworking. As I began researching these machines, I very quickly learned two things. Woodworking machines are really really cool, and new ones are really really expensive. Since I was starting a very capital intensive business on a shoestring, I began looking for used machines to purchase. I have always enjoyed working on and fixing old machines, and I was not afraid of the challenges this would bring. It all started with a planer that my brother Reuben found on Craigslist. Here it is in 2008 right after I picked it up. I had no idea what I had just purchased, except that it was amazing, and it should be able to handle any planing job that I had. It weighed 2,400lbs! At this point, I didn't know much about planers. I knew it was really old, and it seemed to be in really great shape. I had recently come across www.owwm.org, and I dove headlong into this forum, and started asking questions and reading up on old machines. I began to understand what I had gotten myself into, and I was hooked. I started learning about babbitt bearings, and flat belts and square cutter heads, and knife angles, etc. I gradually got to know other members of the Old Woodworking Machines community, both in Oregon and around the country. With their help, I was able to rebuild this planer and get it running. 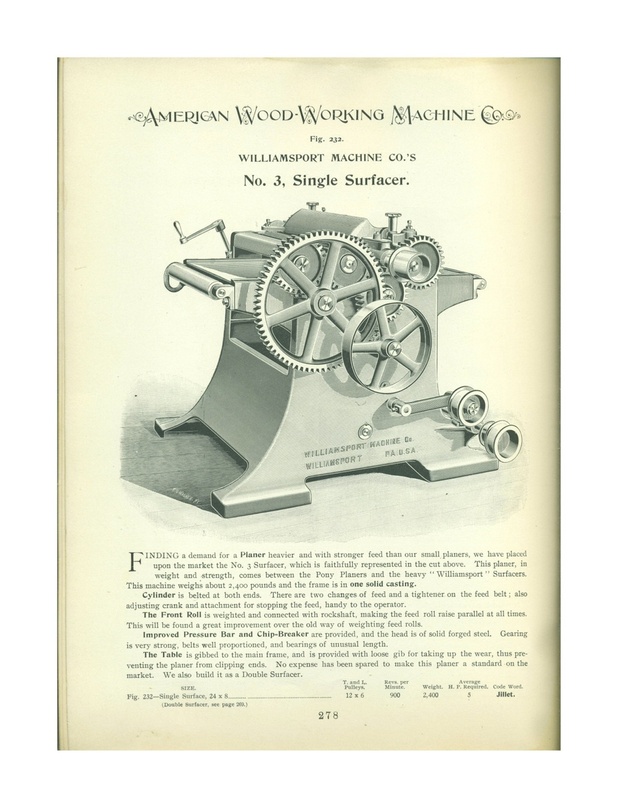 It works just as well as it did 114 years ago when it first rolled out of the factory in Williamsport, PA.
We now use it periodically to plane kiln dried lumber for customers and our own uses. While this is the machine that started it all for me, I didn't stop there. Over the last 6 years, I have been slowly collecting the machines to create an in house millwork shop, where we can make our own tongue and groove flooring. I have learned that these machines that we affectionately refer to as "OWWM", or "Arn" are in many cases of much higher quality than comparable new machines, are a fraction of the price, and have an aesthetic beauty that is completely missing in contemporary machines. And rebuilding these old machines has proven to be a ton of fun. Along the way I have been lucky to get to know other member of the OWWM community. We even hold twice yearly OWWM gatherings here in the northwest. These gatherings mostly entail lots of standing around talking about and looking at machines. The most recent gathering was at Zena Forest Products, and we worked on putting one of my machines back together. Here is a video from the event, courtesy of OWWM member, woodworker and filmmaker extraordinaire Frank Howarth. This will serve to impart a bit of the flavor of the OWWM community. https://www.youtube.com/watch?v=OL_AcFYy5G8. You can check out more of Frank's incredible work on his youtube page. Besides being cool and a lot of fun, preserving, restoring, and working with these old machines has been a fascinating journey into the industrial archaeology of this nations past. These machines were the engines of industry for first half of the 20th century. They have for the most part been rendered obsolete by a global market dominated by low quality replaceable machinery that is manufactured elsewhere. I feel that by putting these machines back into service, I am honoring an American manufacturing tradition that has nearly vanished. Zena Forest Products is a family owned business located in the Eola Hills of the Willamette Valley, Oregon. Our family has managed the forest since 1987 with a focus on maintaining a healthy and diverse ecosystem. We work with Oregon White Oak, Western Bigleaf Maple and other native hardwoods, manufacturing durable solid hardwood flooring, and lumber for furniture and cabinetmakers.